Sometimes fashion likes to shout loud! (Okay, all of the time.) This winter it’s yelling about big, bulky knits, Yeti feet and hooded heads. We hear ya, we hear ya! 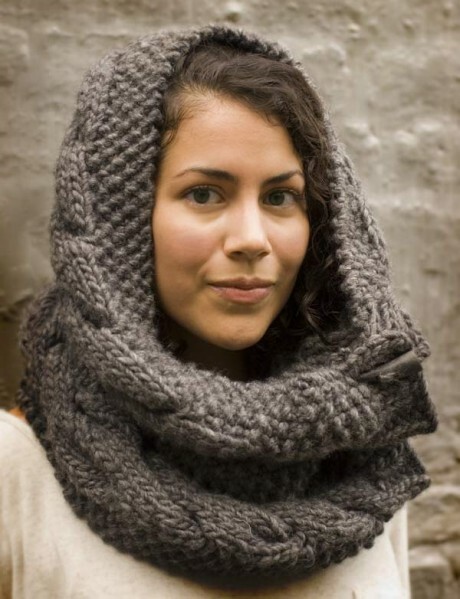 We, at Loop, have taken up our giant needles to make this bulky cowl that you can wear many ways. There are no buttonholes (easy peasy), but the five horn toggles make it possible to button the cowl any way you want; up the front, round the side, or over the shoulder. Wear it as a cape, a shawl, a cowl or a hood. Warm, versatile, quick, easy and fashionable! Happy times ahead this winter! Follow the thread to see the pattern instructions. 2 skeins Brown Sheep, Burly Spun; 100% wool, 226g/121metres. You could substitute another bulky yarn such as Rowan Big Wool, or for real luxury, try our Jade Sapphire Chunky Cashmere, but you will need to buy at least 250 metres. 5 Alaska grey toggles(pictured) or Moose Grey Toggles. Toggles are wonderful for this pattern because you can slip the pointed end through your knitting at any place to create a buttonhole. Beginners. I’m proud to say that a number of my beginner knitters have made this as a first project. If you can knit and purl, have a go at this. Check out this you tube video for a demo of cabling. C10b = slip 5 sts to cable needle and hold in the back of knitting, knit the next 5 sts, then knit the 5sts from cable needle, so that these cross in back of the 5 sts just knit. Moss (or seed) stitch is a repeat of two stitches, 1 knit, 1 purl, that are then worked as the opposite on the other side; the knit stitches are purled and the purl sts are knit. The pattern is edged with 5sts of moss, followed by 10 stitches of cable, which get twisted after every 10 rows, 16 stitches of moss, 10 more cable stitches and a final 5 stitches of moss. The cables twist in opposite directions so that they both twist in towards the centre. I like to use all my yarn for this pattern, so before I begin, I put aside enough spare to sew on the toggles at the end (about 2-3 metres). Cast on 46sts. Knit 6 rows in 2×2 rib, ending and beginning with 2 knit stitches on either edge on the right side rws. Rw 2: k1, p1, k1, p1, k1, m, p10,*k1, p1* 8 times, m, p10, m, k1, p1, k1, p1, k1 (this row was corrected on November 21st). Repeat rws 1 & 2 again and then work a cable row. Repeat rws 1&2 four more times and then work another cable row (10rws between cable crosses). There are 12 cable rows in all. After the last cable cross, work a row 2 , and rws 1&2 again. Finish the cowl by knitting a further 6 rows of 2x2rib with, 2 knit stitches on either right side edge. Bind off. Sew the toggles one ribbed edge of the shawl, placing them in the middle of the ribbing. Give them a little bit of a shank so that they can easily go through the thickness of the cowl. Please let me know if you find any errors in the instructions. This is a free pattern and all images and text are copyright of Loop Knitting Ltd. It is for personal and non-profit use only. This means you can knit it for yourself, as a gift or for charity. You may not sell a garment made from this pattern. You may not reproduce this for sale. Please ask if you wish to translate it or use to teach a class. What a lovely thing and just what I was looking for to knit for four daughters’ Christmas presents! why am I not able to print this?? Oh ! It’s absolutely beautiful !! I would like to know if you plan to publish a more detailled pattern for Old Rose Wrap. I love it and I would like to crochet it. gorgeous Juju!!!! Now I can begin Sonia’s. Ideal for Christmas presents and knits up so quickly. Right, bear with me…I am trying this, and the way the pattern is written seem to me to mean that the edge is done in rib, not moss stitch. So shouldn’t it read “k1, p1, k1, p1, k1” for row 1’s first five stitches, and “k1, p1, k1, p1, k1” again for row 2? Because the reverse of a knit stitch is a purl. Have I got this wrong? I’m only a new knitter so don’t mind me if I’m getting it all wrong! I think you are right about that. I will double check later today. Yes – I’ve just started knitting the cowl for my daughter and realised that the 5 stitch border is written as rib rather thatn moss stitch. Luckily I realised by the second pattern row, so easily remedied! I’ve done up to the first cable cross and it’s looking good. I started the cowl yesterday and came up against the same qeury for the Moss stitch board. I have knit mine in big wool hand it is working out wider and I have only done 9 repeats. I have used three balls in total, but have run short to cast off. Yes, Alex, you are right- pattern should read K1,P1,K1,P1,K1 at beginning and end of both row 1 and 2 so that it becomes moss st and not a rib. Well, I’m a few cables in now, and this is such a lovely relaxing knit. I’m using Twilleys Freedom pure wool which is lovely and chunky. My only problem is the cable row, as my cable needle is a bit small and a bit slippy (didn’t think it through beforehand). I need a nice big chunky cable needle! Can you get huge ones? I might experiment with odd bits of wood. Thank you Juju for such a cool pattern! I can’t wait til I can show it off. For a cable needle I use a double point needle,larger and longer, especially on bulky knits. yes, we have a variety of cable needles at Loop including Chunky ones! I knitted the Grey Owl Cowl as a quick project over Christmas using Rowan Big Wool. It’s turned out really well. In Big Wool I only got 9 cable rows but its still works well. Am now doing another in Rowan Drift – lookin good! I know some new knitters so will be showing them the pattern as i know they will like the cables. Looking out for more patterns and visiting the shop when I am next in London. Hi Juju. I was in the shop last week and I asked you about the pattern for the candy cowl. 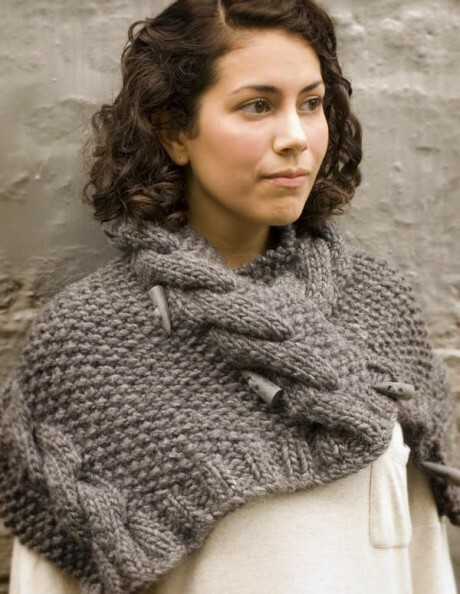 I have just downloaded the pattern for the burly spun grey owl cowl so I will be busy for a while. Looking forward to getting the pattern for the candy cowl as I have some Ozark handspun. I’m not a knitter so reading through the replies is like reading a new language, I’m wondering if you sell this cowl already made? Sorry, You’ll have to find a knitter to help you. I love this pattern. I have not made it yet, although I have purchased the yarn and it is in the queue! I was wondering if you had an online source for the lovely toggles shown in the picture. I’d love to find something similar, or the same but perhaps a different color. I ordered a lovely heather grey burly spun. I can’t wait to get started. Thanks for the great versatile and stylish pattern. oops, sorry didn’t notice the link to the toggle right in the pattern….duh! All, I’m finally reading the instructions carefully so I can begin. I’m coming up with a few questions and I am certain it is because I am a beginner. The “m” for marker. Does this mean to move the marker to the right needle where indicated? Also, I am only getting 8 rows between cable crosses and counting 5 rows of cables…hmmmm. I understand the instructions fine up until repeat rws 1&2 four times (this is where I am getting 8 rows) between cables. Thanks! ok, so you knit row 1 and 2 again after the cable row, then row 1 and 2 four more times? i am wondering if I am missing something since the row after the cable is a row 1, should be right side, but i am on the wrong side if this is how the pattern should be. So really there are 5 repeats of row 1 and 2, then a cable and this is done 11 times. However, I am still confused if it is really a row 1 after each cable. This is how I am reading the pattern, but after the first cable, you do a row 2, which makes sense since it is a wrong side row. So is it row 2 after cable, then what? Please help, i love this so far and am anxious to finish, but don’t want to go further until I am sure I understand it. Thanks! After you do the cable row, you switch to row 2. Then, you do rows 1 and 2 again ( 4 times). Then you do a cable row again. Then row 2. Then rows 1 and 2 again ( 4 times)…and so on. Hope that helped!! Hi there WHAT a lovely thing to knit am enjoying it had a bit of trouble getting going understanding the pattern BUT once I did was very very easy. A beautiful garmet to knit, can see me many MANY of these for presents. Hi there, I’ve just purchased the Grey Owl Cowl as Stitiches here in MArietta/Atlanta and have tried to print out the pattern- the photos come out fine, however, the directions do not print. Am I missing a print button. Please advise…. I don’t know. It works fine on our printer. It should be free. I hope when you say your purchased it, you don’t mean that literally. I love this pattern. Thank you very much for posting it. I’m on cable twist 10 and its looking great. My yarn was a wee bit thinner than yours, so I tried doubling the strands. It looks pretty warm. Hi Juju, this is my first cable project. I’m confused. I completed the cable row and row 2, and then processed to processed with the first 2 rows before the cable, for 10 rows, now I’m on the wrong side and I’m to do a cable row. Is this correct? Shouldn’t I be on the right side? Did I knit the first cable section correctly? If not was I supposed to continue knitting with the cable rows instead? You should be on the right side. Just finish this row and then twist on the next row. Always cable on RS of fabric. Hi Juju, I decided to make one of these lovely cowls for my DIL and one for her DIL – have finished the first one, bur cannot find any beautiful toggles like the ones you used. Can you give links to find these? I did find some cream ones on e-bay, but the seller only takes Paypal and I don’t do that. My first cowl is a serene light olive color, the 2nd will be a white and blue flecked yarn. We sell lovely toggles at Loop and send them all over the world. Sorry for my ignorance, but I still could not figure out how to button the toggles without the eyelets.If we pierce them through the knitted fabric will it damage the pattern and knitted fabric ? Thanks for posting the pattern. The photos are lovely. I read from an earlier post that rows 1 and 2 are repeated 4 times then a cable row and then row 2 and then you start again with rows 1 and 2 (4 times). But, that still gives only 9 rows between each cable row, not 10. Am I missing another row? Hi, I came up to Loop a couple of weeks ago and bought the yarn for the Owl Cowl. I love it, so warm and chunky; it makes a terrific hood. I love visiting Loop, it’s absolutely inspirational. Hi Jeanne, it is a cowl, with buttons to make join in a cylinder. Because it is knit sideways, if you wanted it to join without buttons, you could either omit the ribbing and sew it together, or start with a provisional cast on, omit the ribbing and then graft the two ends together. seems i’m haveing a problem figureing out where the toggles are sew at .do they go on the ribbing,or where? love the pattern. Hi there, yes, they are sewn on the ribbing. Hope that helps! What weight of yarn would you suggest trying this with? I live in the US so the ones you suggested aren’t going to work for me. Anybody have any thoughts of weights, if I’m using 10mm needles? Thank you! Hi! You will need a super bulky yarn, so something that knits 10sts to 4 inches. Hope that helps! I’m relatively new to knitting…and self taught so I do a lot of googling to make sure I’m understanding directions! When a pattern says ‘right side rows’ is that the first side I start working on after cast on? The ‘right side’ refers to the to side of your work that will be on show – so the ‘public’ side of the cowl. Defining one side as the right side in this case ensures that the correct side of twisted cable pattern will be visible when being worn. In addition to this there is of course the wrong side (WS) that will be the hidden side of your knitting. When you ask is it the first side you start working on after cast on, the answer is – sometimes! your pattern will tell you if the first row is a RS or a WS. This then helps with you understanding the pattern and any stitch patterns that feature in it. Hope that helps – do let us know if we can help with any other queries. 8 Pings/Trackbacks for "Burly Spun Grey Owl Cowl"